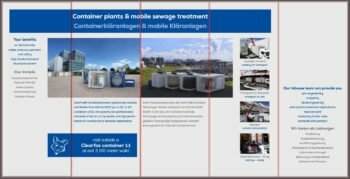 PPU engineering (in German: “Umwelttechnik GmbH”), as one of the leading companies in Europe for packaged wastewater treatment systems, currently prepares to enter the market in the USA. The ClearFox® range of products, made in Germany by PPU, are recognized in Europe as a simple and effective, as well as intelligent and economical wastewater treatment solutions. ClearFox® products are for domestic, commercial and industrial applications. Both are attended by a Clearfox product consultant, Mr. James Clarke, who is the contact person for all information and product requests. Mr. Clarke will give a short presentation about the ClearFox® product range. All of the ClearFox® sewage treatment products have unique features, and offer a very efficient method of wastewater treatment. ClearFox® is looking for strategic partnerships with existing distributors, wastewater specialists and tank manufacturers. The ClearFox® product range offers tank manufacturers, agents and distributors an opportunity to increase their business and profit margins significantly, by having access to a unique, market leading suite of products.